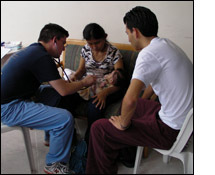 During the week of May 14-21, 2010, I had the distinct privilege of traveling with colleagues from different medical specialties to give free health care to communities in Ecuador. It was the first time I had been to Ecuador, but not my first trip to an undeveloped country. During the week there, our group of 40 saw almost 1,000 patients in 4 clinical days. Only one other colleague was a Pediatrician. With over 2/3 of the patient population being children, the two of us saw roughly 600-700 children. It was a remarkable experience that I will remember and hope to participate in another brigade in the coming years. Our journey started upon arrival to Quito, where we took a 3 hour bus ride to the small town of Cotacache. In our first clinical day, we saw patients from the Ketchua people. The Ketchua are indigenous to this part of Ecuador. From there, we traveled to Santo Domingo, a city in the lowlands. There we had 2 clinic sites, and the group of providers was divided between the 2 sites for 2 different days. The first day I spent was in a poor neighborhood of Santo Domingo at the established Shoulder to Shoulder Clinic called Centro Medico. There I saw some interesting cases including a child with Cruzan Syndrome and a couple cases of Cerebral Palsy. I was happy to have our Physical Therapy team from UK there to assist in care for these patients. The next day was spent at the village of another indigenous group. At the end of that day, they shared with us a ritual "spiritual renewing" ceremony as well as some of their music and dance at the end of the day. It was a refreshing and rewarding experience to take part in, especially after a hard-working day of seeing patients. Our last clinic day was spent in a University that houses mothers and their children who suffer from malnourishment. They take classes on nutrition and cooking there. A lot of the concerns of the families we saw at this clinic centered on malnutrition and intestinal parasites. It was very rewarding to be able to treat and counsel good nutrition with these families. Overall, the trip was a success. I attended to and learned from a people I had not known before. It was a personally and professionally enriching experience. I thank the Benjamin Josephson Fund for helping to make it possible.